Testament is G.C. Waldrep’s fourth full length collection, not counting chapbooks and collaborations. 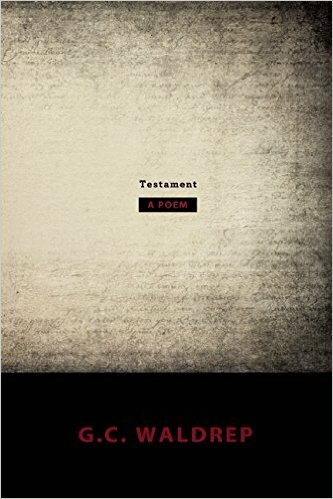 Formally distinguishing itself from his previous work, Testament is presented as a single, long poem in sections whose nearly every line is left-justified and of equal measure. Provocatively, its most salient concern is with the possibility of “gender as a lyric form” (more about this in a moment). Alongside this stated ambition, the notes tell us that the poem was conceived as an “exploration and response” (146) to books by Lisa Robertson, Alice Notley, and Carla Harryman. Thus, a male poet, interrogating gender, responds to three female writers and calls this response Testament (read: bold). Intensifying this audacity and seriousness of intent, a prefatory note reveals that the book was originally drafted at Hawthornden Castle, during a three week stint in July 2009 while the poet was on a retreat. Given these facts, as well as the poem’s length—142 pages—a reader would not be faulted for expecting a grand statement, perhaps even a manifesto. After all, everything about the book’s circumstances seems framed with deliberate, nearly grandiose intent. as seduced or displaced by time. you think something has an end. properly to bear at the wedding feast. And yet the book is, in fact, filled with clues, and it does reward a certain kind of attention by summoning a handful of the poem’s recurrent motifs into a kind of final pageant at the end (pageantry is also one of the motifs; see the opening passage quoted above). As such, the book is paradoxical, contradictory, and inexhaustible—and these are the marks of its genius. To some readers, this inexhaustibility may provoke frustration rather than wonder. And while my response undoubtedly tends more toward wonder, frustration—that is, an uncomfortable emotional and epistemological re-set in the face of incompletion and interruption—is an essential ingredient in this book. The magical irony of the work lies in the fact that attending to this frustration is immensely rewarding: through such attention, one’s listening discovers a new idiom of extraordinary freedom, dexterity, and scope. leisure options, chestnut geldings on the beach. One reading of this would suggest that imagination, perceiving no limit, threatens to proliferate form in a kind of viral pageantry of representation (cf. “Viral, this severance”). This situation, as I understand it, results from the global, capitalizing imagination (more on this in a moment) that mimics what it has been severed from—namely the differentiated, gendered, mortal bodies which allow it to dwell within a scope capable of morality. When disembodied, imagination no longer has a home (cf. the aforementioned “come home”), but crosses distances—between bodies, places, territories, selves—in an endless attempt to incorporate, to contain, to complete. As counter to this tendency, the poem considers, in parentheses, “(A poetry that honors the distance / it transposes. Or subverts it. This, / then, the moral imagination. )” The idea, it seems, is this: a poetry of moral imagination would at the very least acknowledge and engage—through either subverting or honoring—the distance it crosses in translating phenomena into linguistic symbol. Such a poetry would not capitalize upon its material but enact an ecology or climate of troubled, incomplete reciprocity—it would be marked by transits, confusions, incursions, and movements in the between. in this particular dialect, this alphabet. in front of itself, as if it were a mask. is over. Some people never notice. has retired, fallen away, or disappeared. title to—not much, it seems. Here, the nation-state offers its protection—its asylum—and then incorporates its protected subject into a script wherein the state is an absolute point of view, a body of immense scale for which each protected subject is only an organ, or perhaps a nutrient. Here and elsewhere, the poet is haunted by the suspicion that we are all living within a totalizing system of representation—“You are surely in a movie somewhere. / To whom does one pray in such moments?” (77)—and that the other players (acrobats, ventriloquists, agents of “the city”) will soon become apparent, or that the poet himself, and his poem, will be exposed as disposable signifiers in some all-digesting mimetic system. rogue claimant under martial law. in the labyrinth, and its dependencies. Ultimately, Waldrep’s poem seeks a way in which to morally imagine and inhabit our dependence upon other bodies, and its discovery—its revelation and testament—is that one’s poem must in turn be inhabited and imagined by this dependency. Thus, the poem repeatedly opens itself up, vents, releases, incurs more and varied content, and bears the marks of it all: the seams are everywhere; it is a poem of seams. The poem acts as an endless receipt of things heard, taken in, mistaken, distorted, fought, and believed in. The poem’s other’s become articulate, and its speaker misreads other’s poems: “Inside the created lies the uncreated. Outside, also.” In its utterly singular way, regardless of the dissonance it incurs along the way, Testament effects this reciprocity between the world within the poem and the poem within the world. Waldrep has given something wonderful: a poem whose testament can be trusted because it allows us to doubt. R.M. Haines was educated at Kenyon College and the University of California Irvine. He has received a Glenn Schaeffer Fellowship for his work and is currently a doctoral fellow at the University of North Texas. His poems have appeared in or are forthcoming from Salamander, Spoon River Poetry Review, Faultline, and Poets.org.